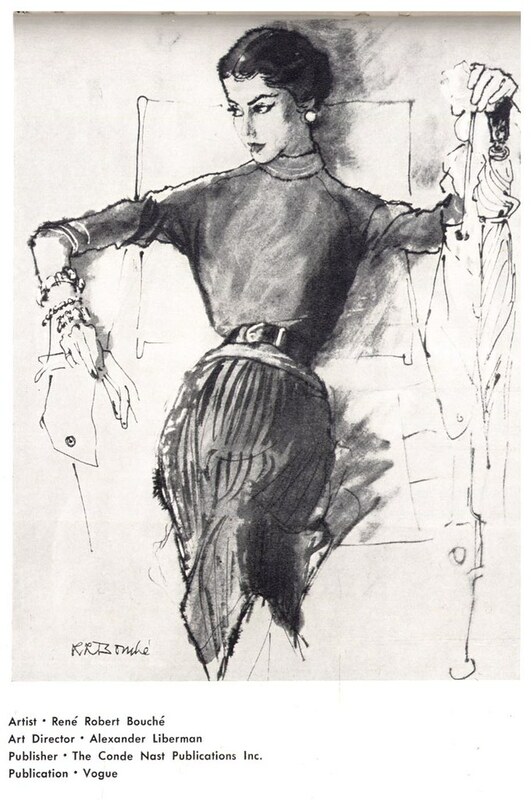 Several people have connected the dots for us this week, proposing that Eric must have been an influence on another prominent fashion illustrator of the time, René Gruau. But just how far did Eric's stylistic influence extend? Interestingly, the editors of the 1952 Art Directors Annual chose to put the René Bouché piece above and the Eric piece below next to each other on the same page. 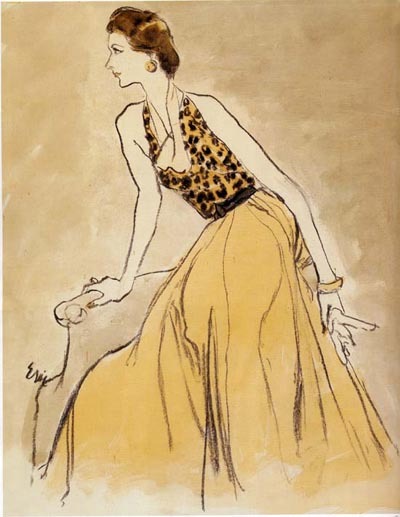 Yes, they are both fashion illustrations from Vogue, from the same year. But did one artist influence the other? 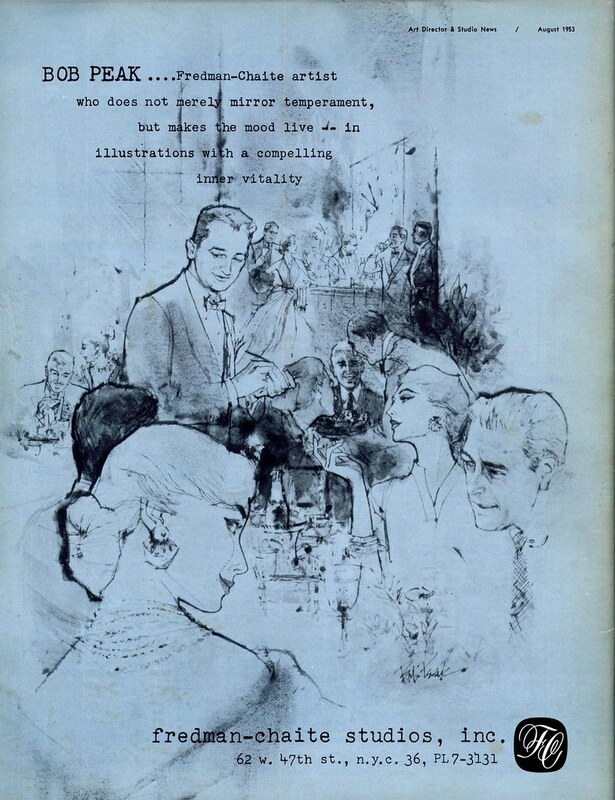 Walt Reed's biography of Bouché in The Illustrator in America doesn't say. 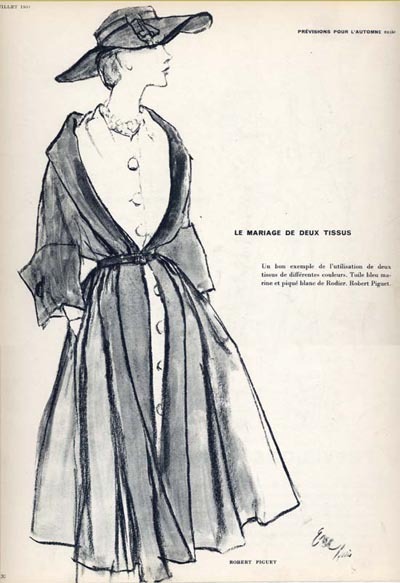 However, Eric had already been an important regular contributor to Vogue for years by the time Bouché had his first piece published in 1938 in the magazine's Paris edition. 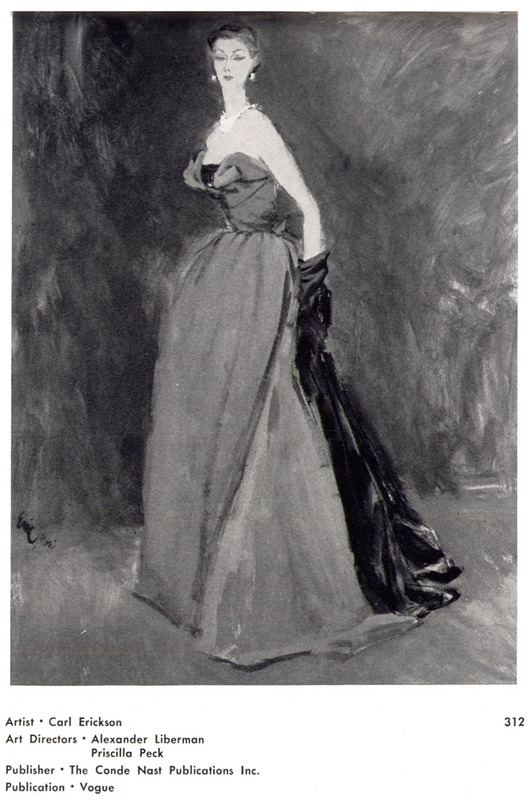 I think its safe to assume Eric must have influenced all of fashion illustration during his time. ... and Jack Potter (below). "Eric was Jack's favorite artist," Daniel wrote to me in an email the other day. "He told me that from time to time he was called on to do similar work to Eric. I think it was in part because Eric was either too busy or drunk to do the work. And Jack was able to do what was needed." This, in my mind, raises the prospect of an even further influence for Eric: if he made such a strong impression on Potter, is it not possible he also influenced Bob Peak during his early days? This is an exciting revelation for me... it explains the 'family tree' of how Eric's fashion illustration style found its way into mainstream illustration during the 50's. "He would draw from the model & a few lines would tell everything. He lived in the building diagonally across from Cooper Studio. We would see him in the early morning. He had a bowler, beautiful clothes, a Chinese chef & a poodle. Sometimes he'd be standing out in the middle of the street at Lexington & 57th directing traffic with a newspaper when he when he was headed for Third Avenue, for his morning martini. He was the ultimate artist -- a magnificent artist. Never sober, but never disreputable in any way. He just led a charmed life. He would come into a bar where all the guys from Cooper's went -- The Venetian. It was just below the studio, on Lexington. He always had a carnation in his lapel. He generally had a walking stick with him. He loved the fights. He would come into The Venetian & demonstrate how Sharkey fought, how Tunney fought, & he would prance around. Everybody would go up to the Waldorf for lunch, & so would he. He had a whistle he'd blow when he got in there, & the waiters would come over & take him to a table. He would have a lot of martinis & eat a little something. He had a certain style that doesn't exist anymore." *Thanks to Daniel, Neil, and everyone who has been helping to fill out the background details on the "ultimate artist", Eric. * My Eric Flickr set. *ALSO* For some truly gorgeous classic b&w illustration art, don't forget to check out the latest CAWS at Charlie Allen's blog. 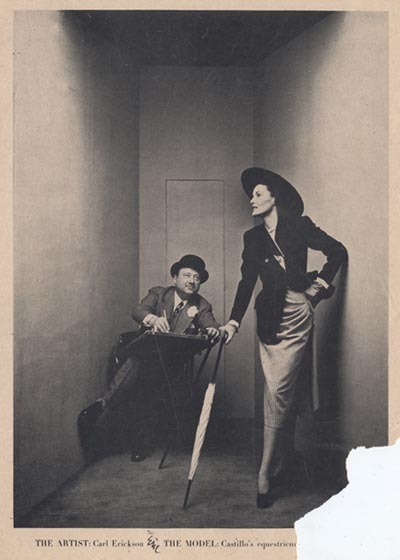 I believe the photo of Eric was taken by Irving Penn. Although I'm not 100% sure. They did a series of them on the main Vogue artists. Though not an official authority on these terribly important fashion illustrators, I can say that rarely is there a class in gestural figure drawing, fashion illustration, nor documentary art at the Fashion Institute of Technology, where I teach, that the likes of Eric, Rene or Jack Potter are not mentioned, amongst other fashion/lifestyle greats. The knowledge and foundation of their understanding of the figure resonates under the deceptively simple line. I studied with Jack Potter and his deep resounding voice still echoes for me as I aim to design the figure and understand space as he did. I try my best to translate the mastery of these artists to my own students. The calligraphic lines emulate the elegance of the Japanese print and the sense of lifestyle illustration is gaining its presence back once again in today's market. These illustrations are simply delicious.